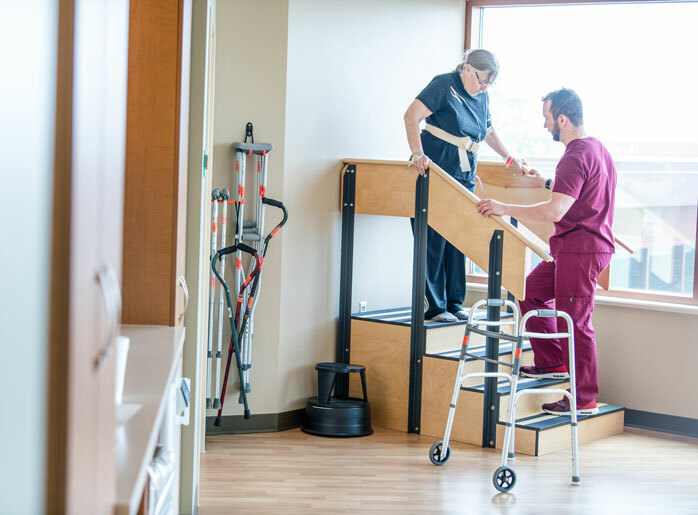 Our Inpatient Rehab Therapy Program provides comprehensive, personalized care in a supportive environment where you can begin adjusting to a new way of life. Customers receive intense and comprehensive care from our team of rehabilitation professionals. Our mission is to empower our customers to achieve their best health. We want to help you improve your quality of life and live as independently as possible. We understand the immense emotional and physical changes that accompany complex medical conditions and traumas like a stroke, brain injury, spinal cord injury, or neurological disorders. We know it isn’t easy to start over or to face the challenges of disability. But we’re here to help. We continually refine our services to meet your needs as well as your families as we help you through all aspects of rehab and adjustment during this challenging transition. Using our knowledge of the community and available resources, we’ll make sure you have access to the support you need – including healthy leisure activities that match your needs, interests and abilities. Each healthcare provider on the Inpatient Rehab team has special expertise and shares our customer care perspective. Our medical director coordinates the rehab process and your family doctor may also take responsibility for your medical management during rehabilitation. We’ve found that Family members and significant others are an integral part of the rehabilitation journey. Having a solid support system bolsters continued recovery, so we encourage routine family presence and participation throughout the rehab process. We’ll include your loved ones in all discussions and decisions as appropriate, including setting your goals. We’ll tailor your care plan to meet your specific needs, both during and after your hospital stay. Schedule a tour to learn more about our programs and meet our care team before admission. We’ll also review expectations with you and your family members during the tour. For more information or to schedule a tour, please call 763-581-8711.